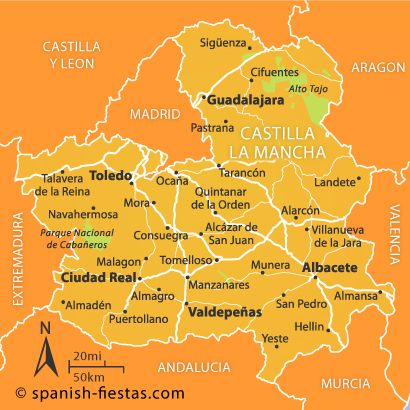 Castilla La Mancha, one of the most sparsely populated of Spain’s autonomous Communities, is divided into five separate provinces – Albacete, Ciudad Real, Cuenca, Guadalajara and Toledo, which is the capital city. South of Madrid and north of Andalucía and Murcia, this is the land of Don Quijote’s windmills and acres and acres of olive groves and sunflowers. Geographically the region can be divided into two separate regions – the extensive, flat plateau, the meseta, and the mountains encircling it, which include parts of the Iberian Mountain range and the Sierra Morena. The rivers Tagus and Guadiana both flow estwards through the region, whilst the Jucar river heads east. Another geographical aspect of note is the area around Cuenca created by erosion which includes such rocks formations as La Ciudad Encantada, amongst others. Before the Romans arrived in the area, this was a land of pasture only, inhabited by Carpetani and Vetoni. The Romans introduced farming on a much more organised level, and the farms created were then taken over by the more significant of the Visigoth families and then, later still, to the Moors. Toledo became an important strategic position for the Romans and the Visigoths recognised its importance by making it their chief city. Until taken by the Christians in 1085 by Alfonso VI, it was the prominent city in the centre of Moorish Spain. When Castile and Aragón were united under the Catholic monarchs in 1492, and Valladolid and Madrid received more royal patronage, the ´dry, waterless land’ that is La Mancha began to lose its elevated position. It ceased to exist completely in 1833, being absorbed into Madrid’s province, Castilla La Nueva. When the autonomous communities were drawn up in 1982, the new region was established. Economically this is one of the areas which suffered most from the drift of young people into Madrid looking for work and there is still little industry in the region outside the main cities and even there it is quite restricted. There is a large petrol refinery at Ciudad Real and a nuclear power station at Zorita de los Canes but the region as a whole lacks energy resources compared to most of the rest of Spain. The most important agricultural products remain wheat, grapes, olives, sunflowers and cotton, although this is also the centre of Spain for saffron growing. 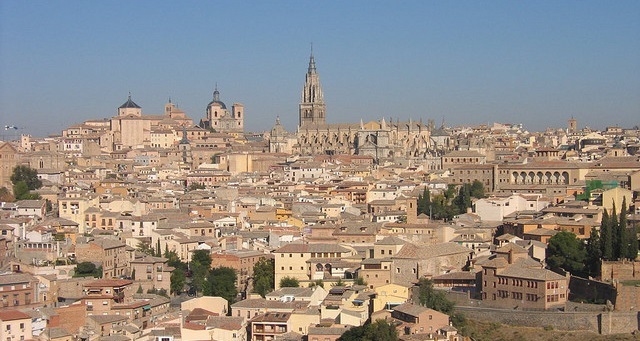 Outside Toledo, tourism has not really developed at the rate it has in many other areas of Spain. You’re highly unlikely to head for Castilla la Mancha as your primary destination but will most likely access its main attractions on excursions from Madrid which is less than an hour’s drive from Toledo, the region’s capital. There had been plans for an international airport in Ciudad Real which would connect with the high-speed AVE rail network between Madrid and Andalucia. The airport was constructed and operated with very limited traffic for three years until its closure in April 2012 amid serious accusations of corruption directed against its investors. There are currently AVE train stations in Ciudad Real and Puertollano and an excellent road system throughout the region which contains the main roads from Madrid to Zaragoza, Valencia, Andalucía and Badajoz as well as the road to Toledo itself. If ever a city had the atmosphere of a living museum, it has to be Toledo. Situated on a hill and more or less surrounded by the river Tajo and the old walls, the old town is totally untouched by modern development, making it crammed with monuments of every age in Spanish history. There are Moorish-Modejar-Jewish buildings – including an incredible Sinagoga del Tránsito which is as symbolically complex as the Mezquita in Córdoba. There is a fine Gothic cathedral and many Renaissance buildings of great merit. The city’s dominant building, though, is the Alcázar, a fortress since Roman times. This was also the site of a terrible siege during the Civil War – you can still see bullet holes and shell damage – but has been rebuilt since. Most harrowing of all for many visitors is the room in which the besieged Francoist leader, Moscardó, refused to surrender even though he was told his son was to be killed if he did not do so. The words telling the boy to ‘prepare to die’ say much about the futility of the war but also about the courage of so many of the people involved in it. Toledo was also the Spanish home town of El Greco and many of his paintings are here, including one of his acknowledged masterpieces, The Burial of the Count of Orgaz’ in the Church of Santo Tome. British visitors to Toledo can often be seen gasping in disbelief at the array of swords and knives on open sale in many of the old shops in the centre – Toledo has long been famous for the quality of its swords; those used in the ‘Lord of the Rings’ films were mostly made here. Travelling on a bus sitting near a teenager carrying a four foot long sword is a most disconcerting experience for most Britons! Perhaps the best views of the city as a whole can be obtained by going over one of the bridges across the Tajo and driving or walking up the hills opposite, where there are many former estates of the Toledo aristocracy which have now been converted into hotels – the Parador is up here. The views of the city, especially at dawn and sunset, are totally breathtaking. Cuenca: The 2nd most visited town in Castilla La Mancha has a well-preserved, picturesque centre, with an imposing Gothic cathedral, but is most famous for its incredible ‘hanging houses’, clinging precariously to cliffs 200m above the junction of two river canyons. Cuenca, unlike much of the region, is close to lush, green forests and impressive mountain peaks but now also attracts many visitors who have read about the city in the final chapters of CJ Sansom’s best seller, ‘Winter in Madrid’. 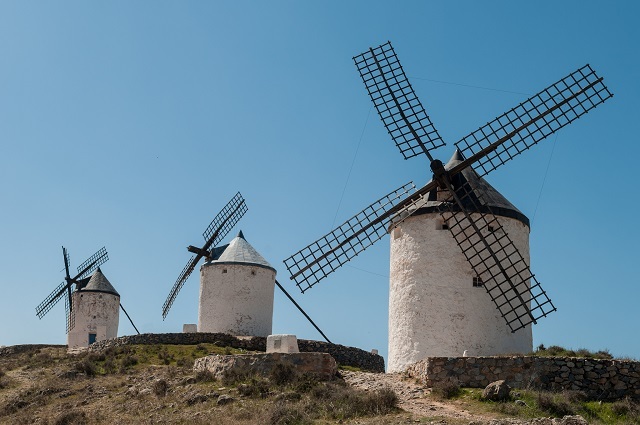 Consuegra: Don Quijote aficionados can still find the ‘giants’ he went into battle against by visiting the windmills at Conseguera and also visit Dulcinea’s house at Toboso. Cervantes’ own home is well-preserved in the village of Esquivias. Guadalajara: A historic city with fine Moorish walls and a surviving bridge across the river Henares, a Mudejar style church and a fifteenth century palace. Climate: The region experiences a predominantly Mediterranean climate, but also has some Continental aspects. The further south you go in the Meseta, then the longer the summers and the warmer the winters become. The mountain areas often experience a high rainfall – with snow at the highest altitudes – whereas in the central areas there is generally only between 300mm and 400mm annually. Festivals: Two annual festivals in the region of major national and international interest are the Corpus Christi celebrations in Toledo and Holy Week in Cuenca. Other festivals of interest include the Moors and Christians at Valverde del Júcar and Caudete; the Festival of Medieval theatre in Hita; the Saffron Rose Festival every October in Consuegra; the January Cow Festival of San Pablo de los Montes; the Festival of the Olive held in Mora each April; and the colourful devil-themed festival La Endiablada each February in Almonacid de Marquesado. Manchego cheese, generally considered to be the finest in Spain, is produced here from ewe’s milk. Popular regional dishes include Asadillo manchego, which is a salad of tomatoes, roasted peppers, garlic and olive oil and Pisto manchego con huevos, a mix of peppers, tomatoes, onions, courgettes, ham and a fried egg. Lamb is very popular, along with partridge but be aware that if you see Gazpacho Manchego on a menu it will not be a cold tomato soup. Instead expect to get a stew of chicken, rabbit and perhaps hare or pigeon served on a piece of flat bread. Toledo is famous for its marzipan – there’s even a shop that has a model of the town sculpted in marzipan in the window. Wine has always been a thriving industry here with the best-known Denominaciones de Origen being La Mancha and Valdepeñas. Whilst many a bottle of cheap and cheerful Valdepeñas has been enjoyed over a ‘menú del día’, recent times has seen a modernisation of the local industry and an attempt to highlight the region’s best crianzas and reservas. Where Have you Been in Castilla La Mancha? 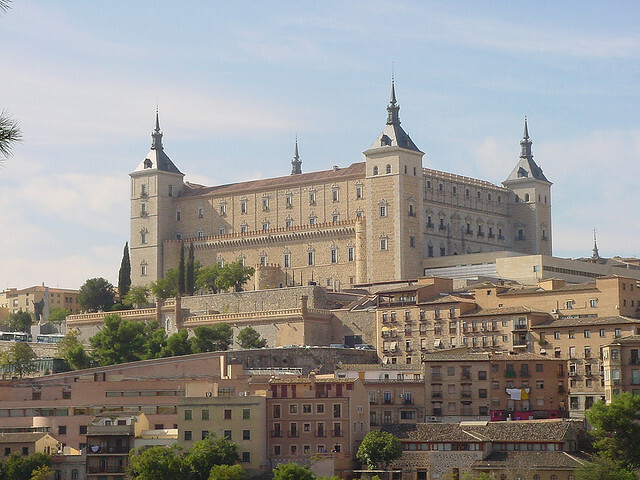 Few other regions have such a key main attraction as Castilla La Mancha does with the wonderful city of Toledo. Have you been there or to any other places in the area? Please let us know your experiences and any travel advice you may have in the comments box below. Thanks Duncan … good luck with the book. Visited this area two years ago,mainly to see the hanging houses of Cuenca. Some lovely typically Spanish hotels and restaurants, the best being in San Clemente on the way back to Madrid airport. It was in fact still a family home, a large house with family photos and antiques everywhere. Staff came in specially to cook dinner for us, the only guests that evening in May. Another great trip, windmills galore and a very laid back atmosphere. So many areas of Spain worth visiting, seems a shame the Costa del Sol for many is the only area known! Thanks Marilyn – sounds like a great trip. Have been to all the places you mention and agree they are wonderful. Fabulous church at Cuenca. House of the Duke of Santa Cruz spectacular. Dulces from the nuns in Toledo are delicious. Have visited Toledo and the windmills twice. Enchanting both times. Toledo is outstanding and not to be missed if you get the chance. It’s probably the place I was most impressed with out of all the places we visited. The mix of cultural heritage is so interesting. We ate the tomato stew you describe at a roadside open-air place that was supposed to have been a frequent haunt of Cervantes. Not sure if that’s true, but we enjoyed the food and ambiance even more because of it. I spent a day in Toledo when I was living in Spain and still have vivid memories of this ancient and well preserved historical city. I recommend to anyone touring Spain to visit Toledo and be certain to view El Greco’s painting, The Burial of the Count of Orgaz in the church of Santo Tome. A masterpiece of the mannerist movement. As usual, Gerry has written a well informed article on that part of Spain. Many thanks…. No road trip to this region would be complete without a few days at the Lagunas de Ruidera. For my family and I, this is the garden of Eden. Also in this national park is the Cueva de Montesinos, where Miguel de Cervantes wrote part of Don Quixote. Great recommendations Ian … thanks. Thanks for your always very interesting articles this one especially. Just to back up your comment about how empty this part of Spain is I recently saw in El Pais that this area and that between Madrid and Burgos has less people per m2 than the area within he Arctic Circle. Secondly when using the motorways I never feel this part of Spain is as empty as that between Madrid and Burgos, here you can travel miles without seeing any homes or significant areas of population whatever but again I refer to the A1 motorway and not inland. My wife often wonders where all the people come from to work the land. Anyway thanks again and best regards.